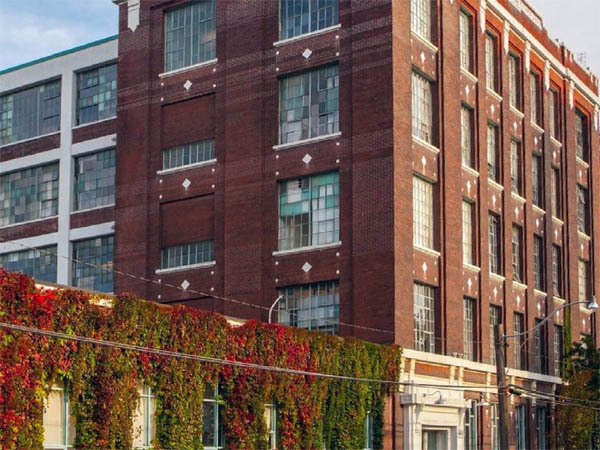 The Wallace Station Lofts are housed in an old glue factory in a small industrial pocket of West Toronto. 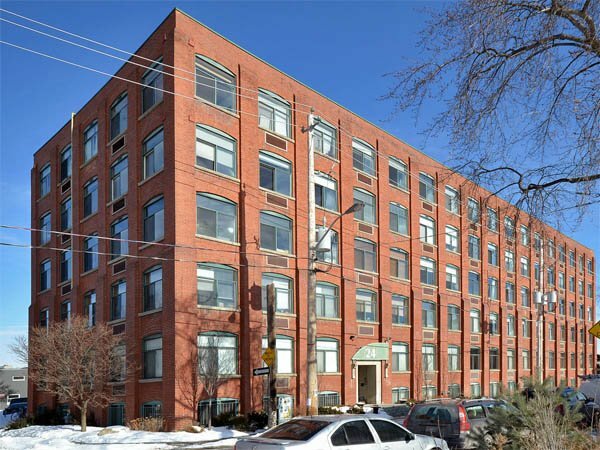 Located near Dundas and Bloor, the Wallace Station Lofts consists of a four-storey factory built in 1928 or 1929 for an adhesives company, with a coach house addition from 1949. 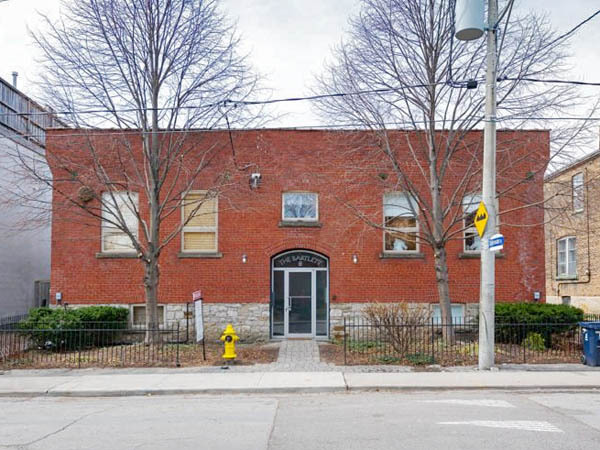 The story has always been that Wallace Station used to house the Canadian Glue Stamp company, but that does not seem to be the case. The oldest reference I can find is to the National Adhesives Company, which makes a lot more sense seeing as it was called Nacan for decades prior to conversion. In fact, the company changed its name and became Nacan Products Limited probably in the 1950s. But they were a Canadian glue company, so at least that part is correct! 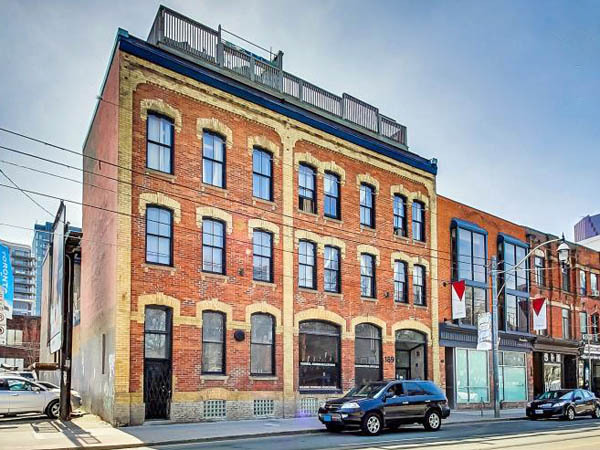 The Wallace Station Lofts feature a four-storey loft building and five exquisite coach houses behind. 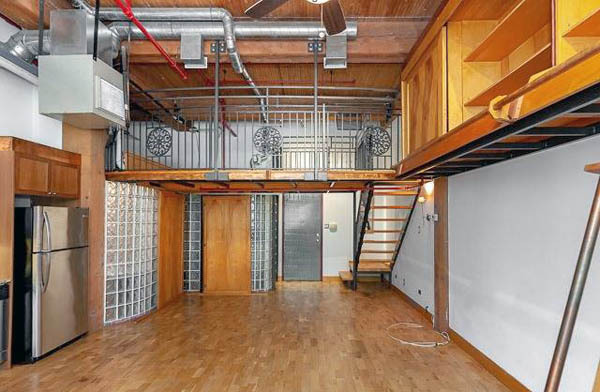 Both contain a unique collection of specially designed hard lofts, each uniquely different, and all featuring impressive architectural features while maintaining original structural integrity. 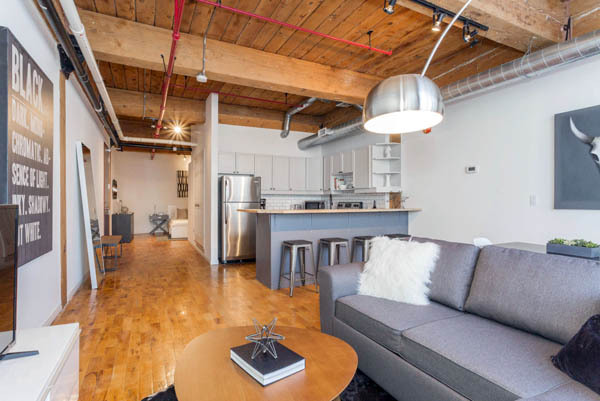 So many owners have customized their units, you can find finishes that include burnt copper backsplashes, and floors made of various kinds and shades of old wood. 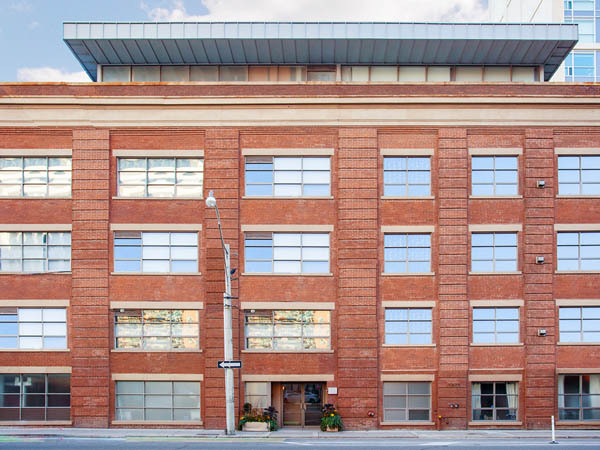 The industrial red brick façade of the main Wallace Station Lofts structure has been preserved. 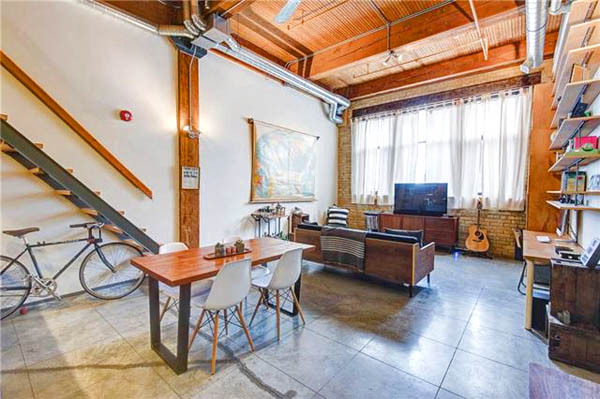 Features include the original freight elevator, working sprinkler system, and two-foot-thick beams of Douglas fir held together with cast-iron fittings. 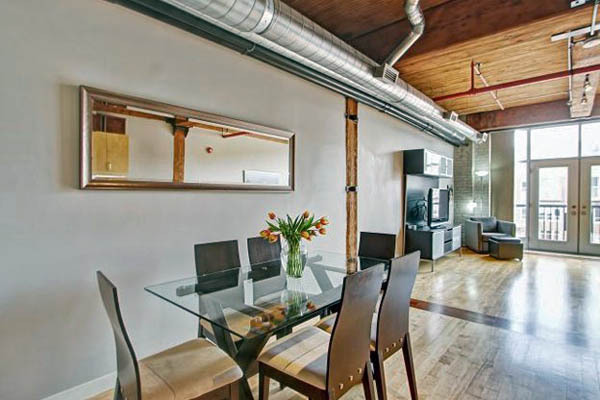 Three floors of the factory are above grade, with the lowest floor partly below. 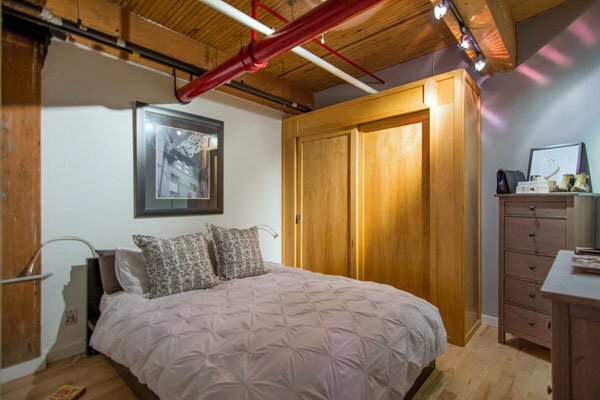 The 38 units range in size from 627 square feet up to the largest at 2,331 square feet. Most are in the 750-950sf range and they all have operational wood stoves. 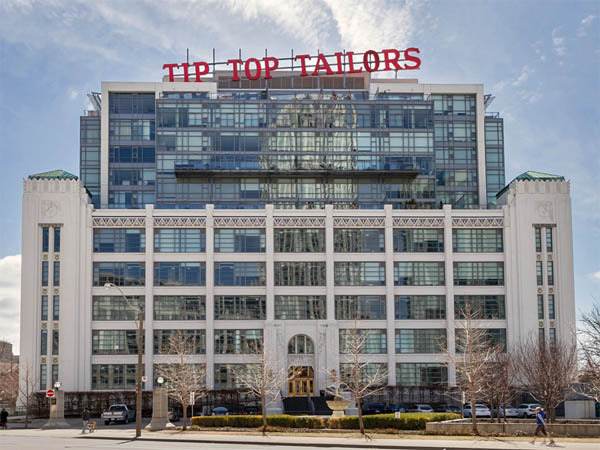 Studios and one-beds up to 2-bedroom lofts, with the showpiece unit on the top floor – well over 2,000 square feet with a round skylight where the smokestack used to be! 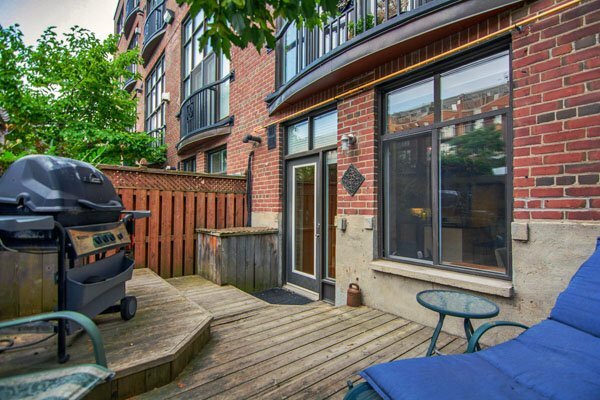 Plus a massive rooftop deck. Wow. They all share in a stash of tons of brick and wood. 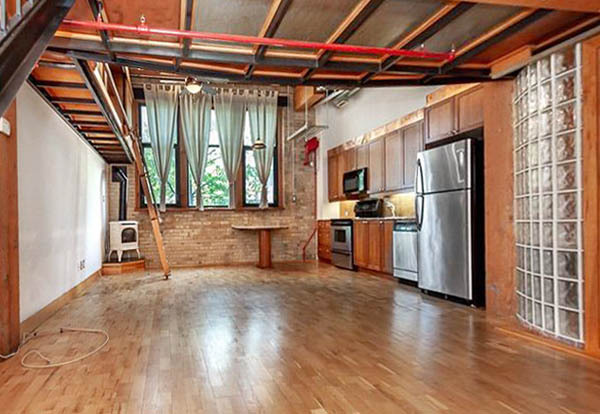 I personally am in love with the amazing original stairs with massive wooden beams passing through them. 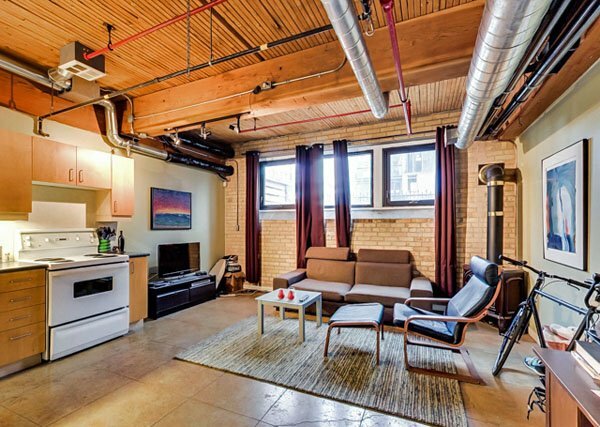 Very classic authentic loft styling at Wallace Station. 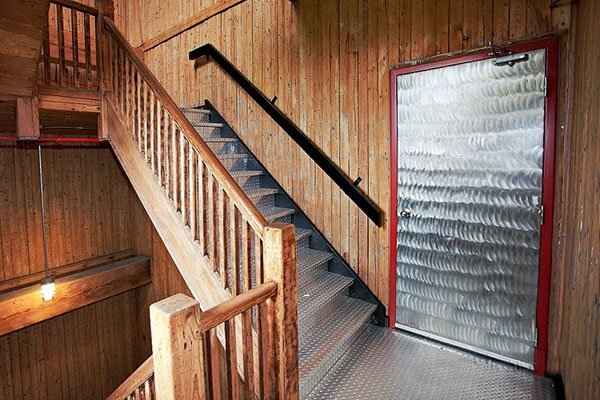 The awesome original stairs at the Wallace Station Lofts – so much wood! 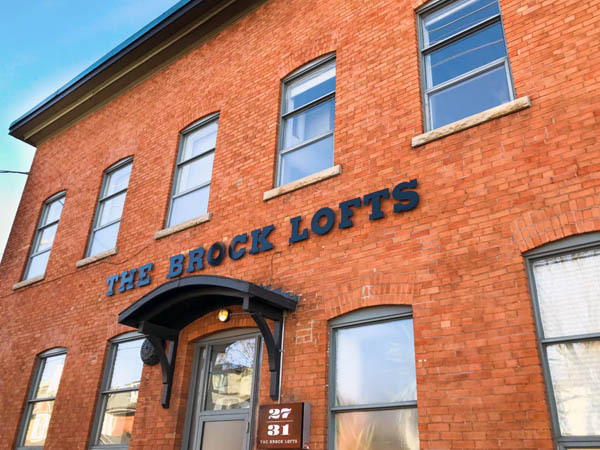 The lowest level lofts come with fenced outdoor patios, while the upper level lofts come with Juliette balconies and terraces, including some with rooftop gardens. 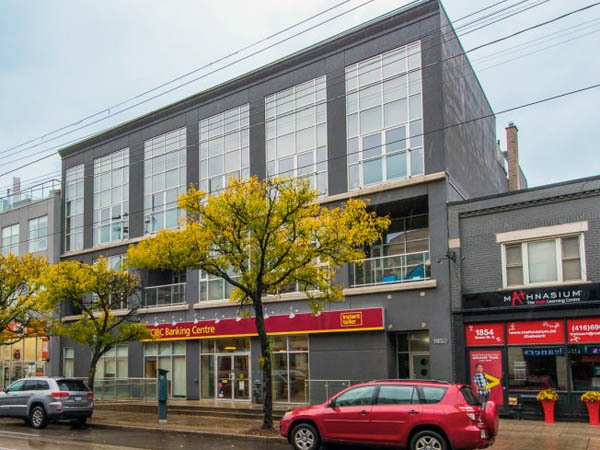 Residents of the upper level lofts will have the stunning vistas of the surrounding Dundas-Bloor neighbourhood, High Park and downtown skyline. 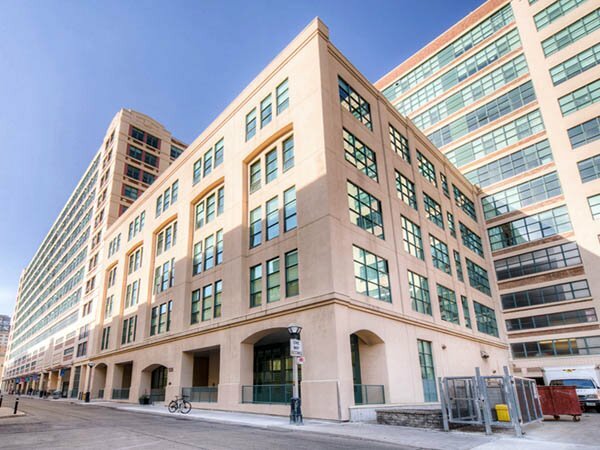 Given the building’s east-west orientation, there will always be maximum exposure to sunlight throughout the year. 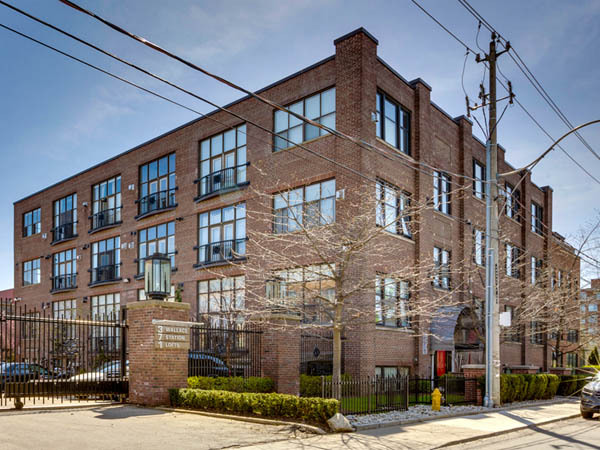 Wallace Station Lofts also offers the more townhouse-style coach house lofts behind the main building. The light-filled interiors feature three levels, ceilings up to eighteen-feet high, direct private entries and rooftop gardens. 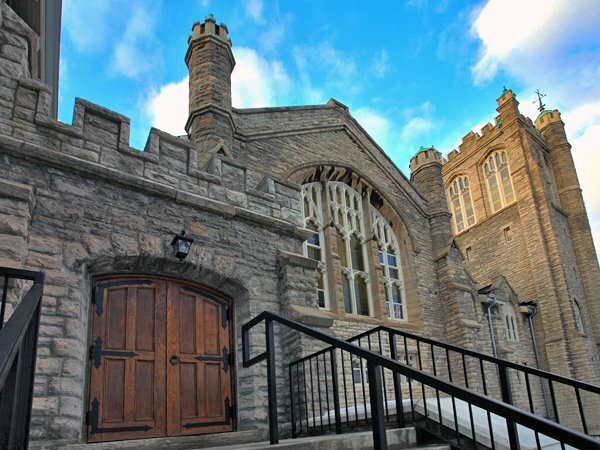 And like the main building, the coach houses’ heritage features have been carefully preserved, thus adding to the visually aesthetic appeal of the structure. 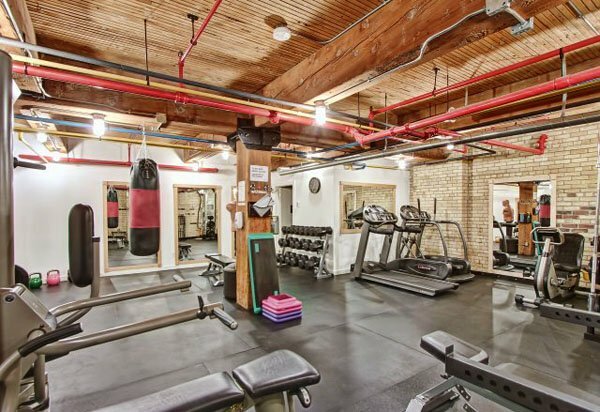 Even the gym at the Wallace Station Lofts is full of wood and brick. And sweat. 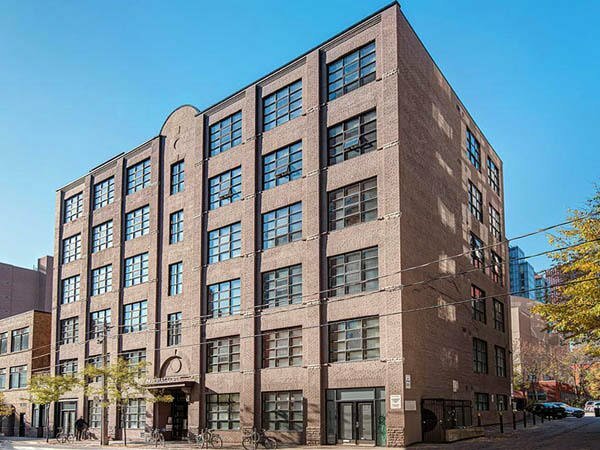 Wallace Station Lofts was the vision of developer George Vandenbergh, a former Montrealer, whose passions include architecture and antiques. 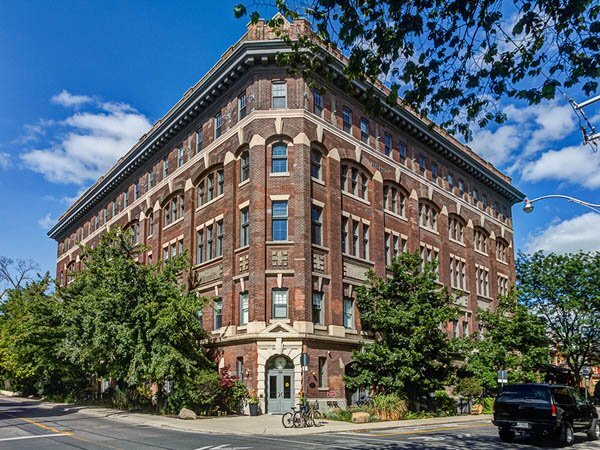 Not only did he see the Wallace Station Lofts as a historic landmark, he considers the renovation of such buildings as a means of providing people with an alternative to contemporary condominiums. 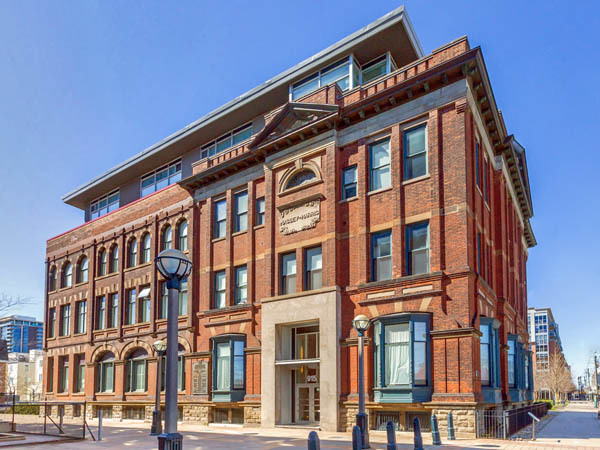 With an extensive background in historical art and furniture, George Vandenbergh selected Terradigm Developments Inc. to ensure that the Wallace Station Lofts were brought back to life for residents to admire and enjoy. The property was original part of one big lot that ran from the train tracks east to Perth, and then from from Wallace south to Earnest. 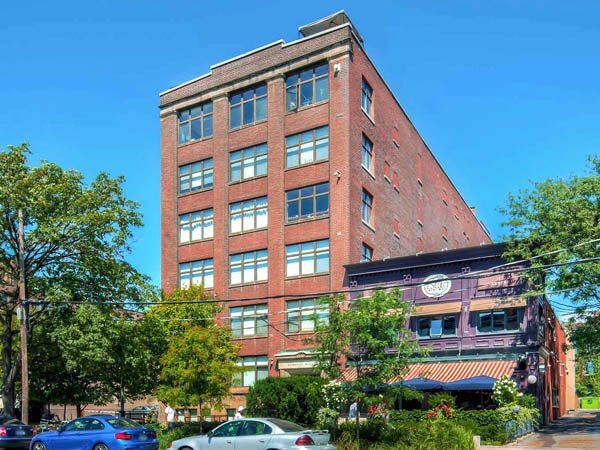 It was owned by Consumers Box & Lumber Co. Ltd. in the early 1900s – but on the 1924 Goad’s map there is a building penciled in at the top labeled Glidden. 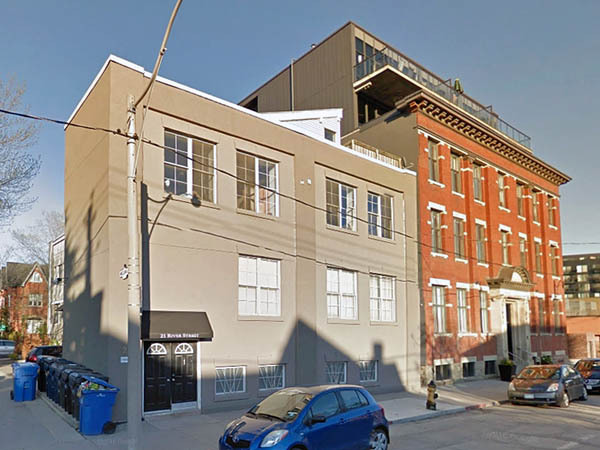 Except the paint factory was across the street, on the north side of Wallace where the new townhouses are now. 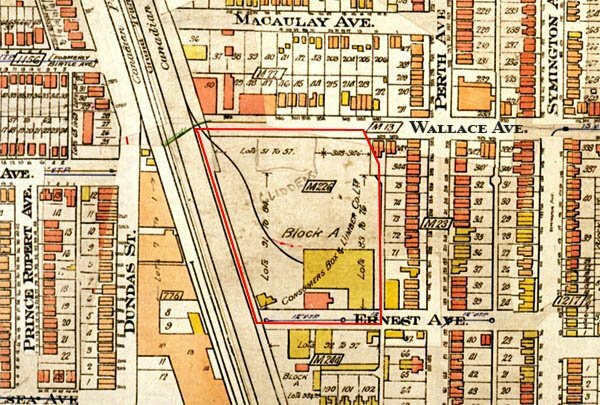 That would have been the old Glidden offices, now demolished, that were just to the east of the Nacan factory at 351 Wallace Ave.
And it would have been right at the end of the street, where Wallace Avenue met the tracks, where the old Wallace Station would have stood. Long before the glue factory there was a little railway station. 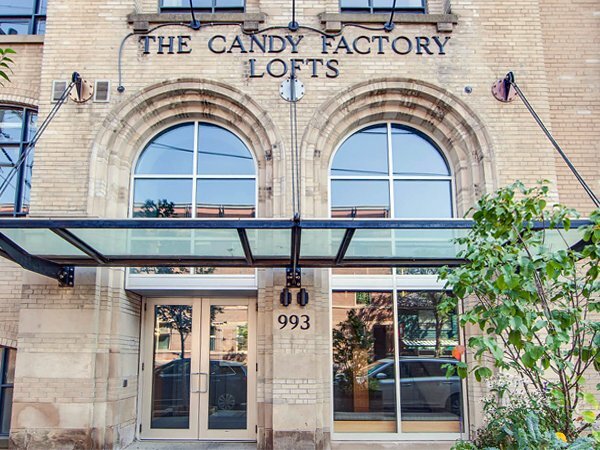 Tracks are still there, but the station name only lives on in the moniker of the lofts. 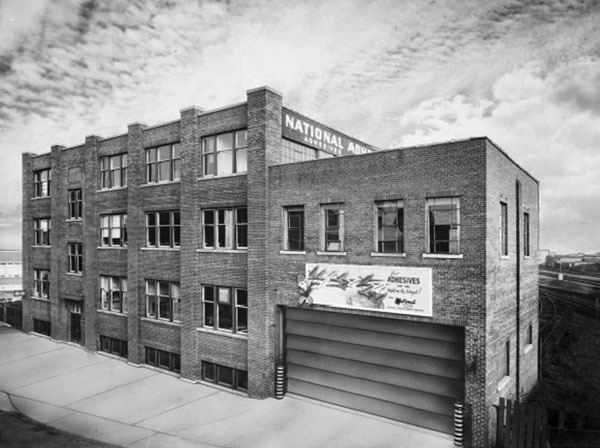 Originally housing the National Adhesives Company in the 1920s, the company changed names to Nacan Products Limited. 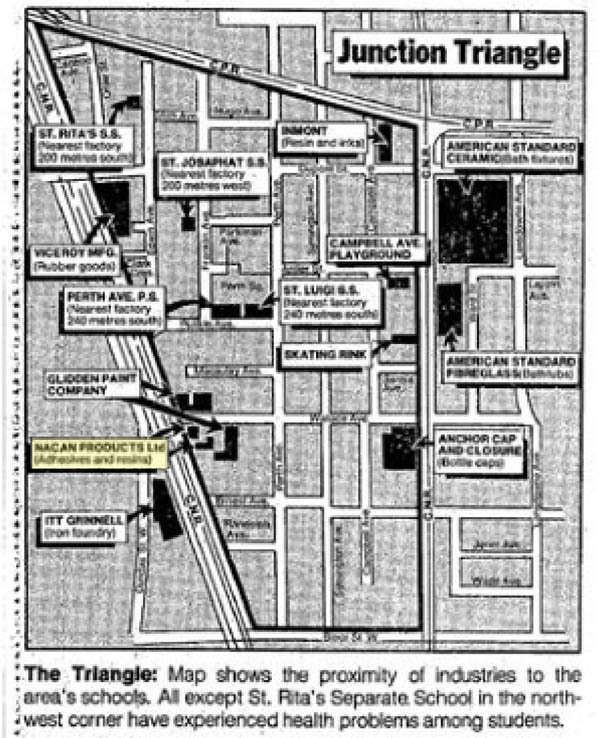 They were sister companies with LePage and Indopco (formerly the National Starch and Chemical Company) and all operated out of the same plant. They were all owned by Unilever. I wonder if the name change happened around the time they were acquired by Unilever…? 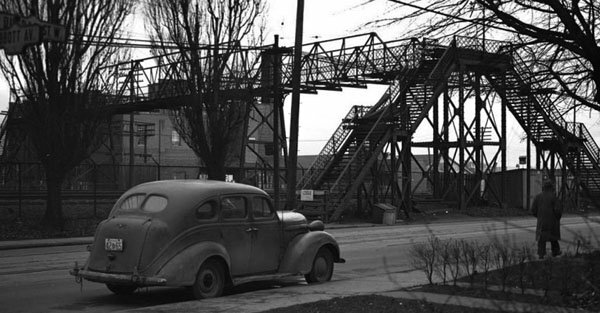 Nacan was one of the major industries in that immediate area, along with Glidden across the street and the Viceroy Rubber Factory to the north. All was fine until the 1980s. 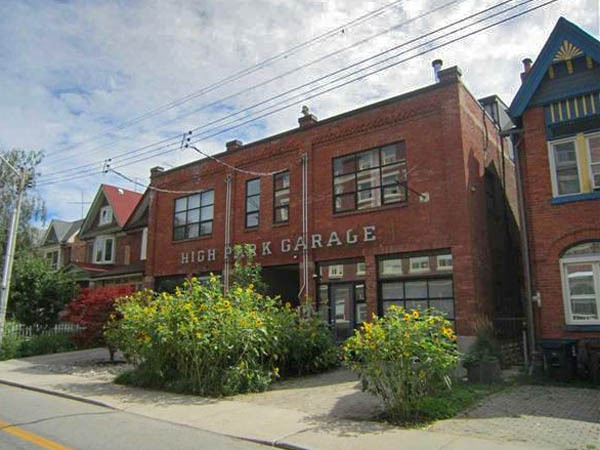 At the start of the eighties, the Junction Triangle was home to 15 industries and about 5,500 people. But then problems started. 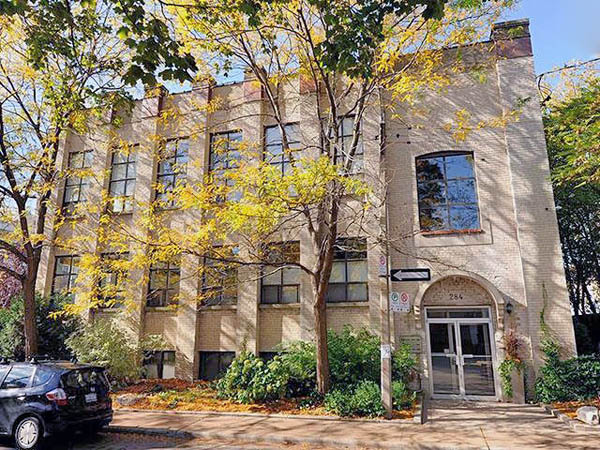 By May of 1980, the Ministry of the Environment received four complaints from residents about Nacan, five about Glidden and one about Anchor Cap. 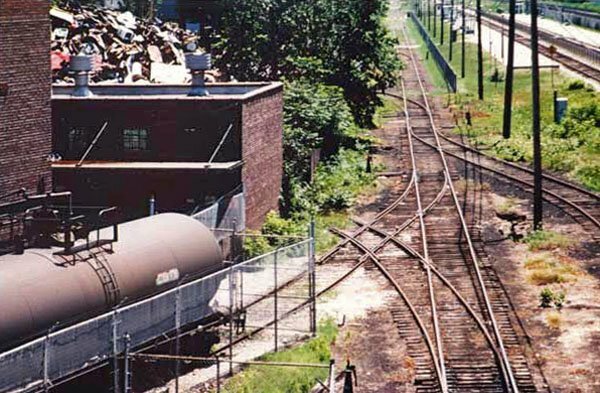 The Globe and Mail would later call the area “an industrial minefield“. 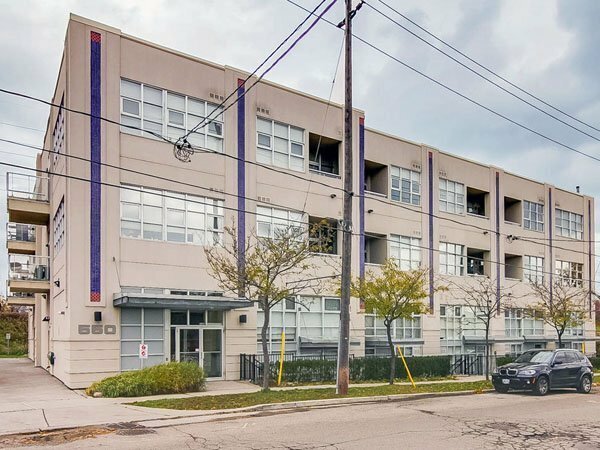 American Standard was named responsible by the Ontario Ministry of Environment for excessive styrene emissions that sent 80 children home from a skating rink on Campbell Park. A spill at the Glidden plant caused three neighborhood schools to close for the day and sent seven people to hospital. At the same plant in less than a year, two open storage tank valves dumped 440 gallons of flammable liquid vinyl into the sewer system. Leaks in the emission control system at ITT Grinnell released clouds of unburned carbon throughout the neighborhood. “There are times it’s so bad you can’t see the sun” claimed a local worker. Mayor Art Eggleton threatened to expropriate polluting factories if the problems persisted. 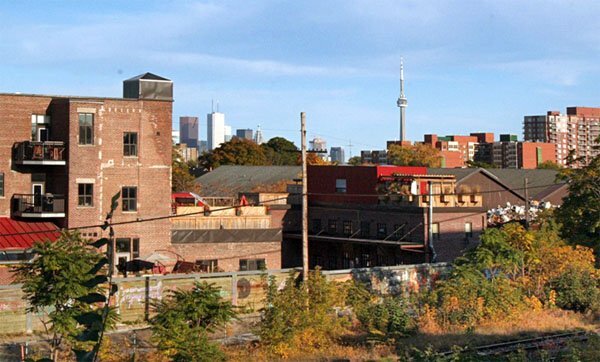 In January of 1983, the Ontario Municipal Board upheld a Toronto bylaw restricting industrial expansion in the area. Changes to the Occupational Health and Safety Act in 1987, established individuals right to information on hazardous materials in their communities. 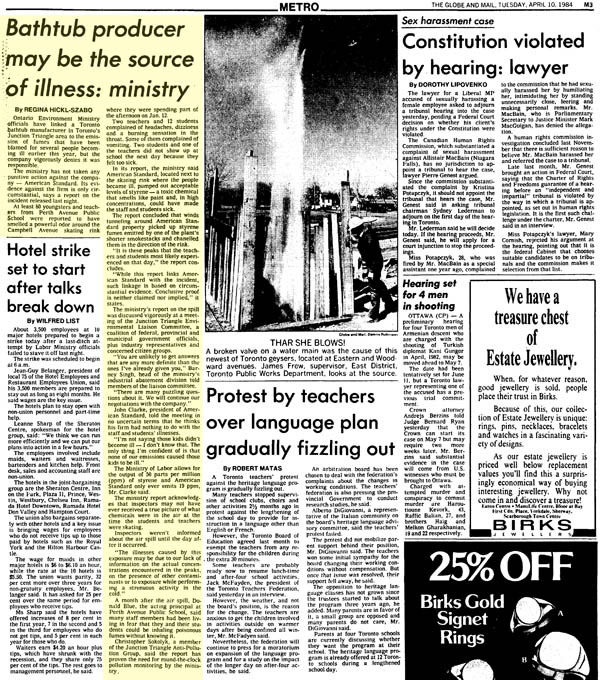 But yet another accident in July 1988 lead to calls for all heavy industries to be moved out of the area. An explosion at Wallace Avenue plant of Nacan, a paint and glue manufacturer, showered chemicals throughout the neighborhood. Seven children and two dozen adults were sent to emergency complaining of sore throats, chest pains and burning sensations. 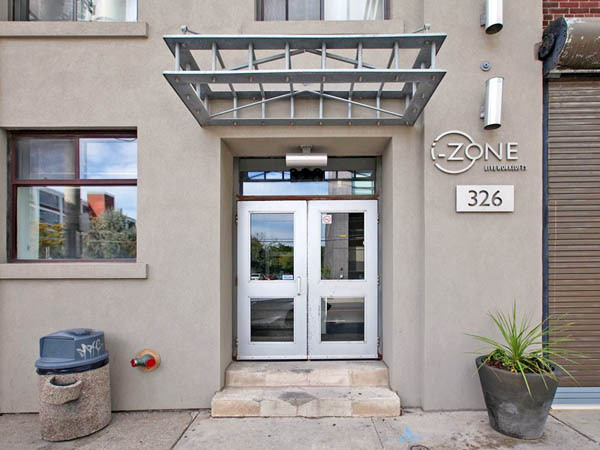 Faced with extensive repairs in addition to heavy fines, the company moved operations. And thus the building became vacant. 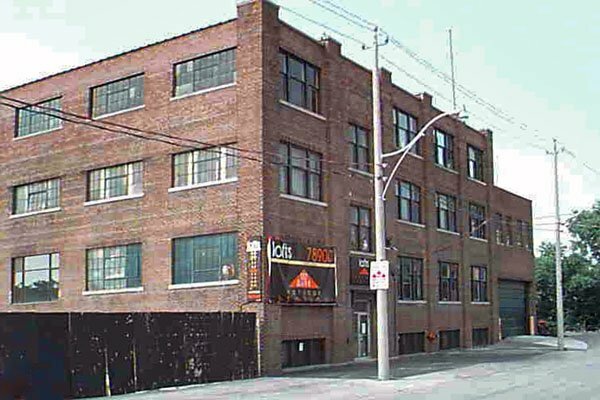 The old Nacan building sometime in the 1990s. 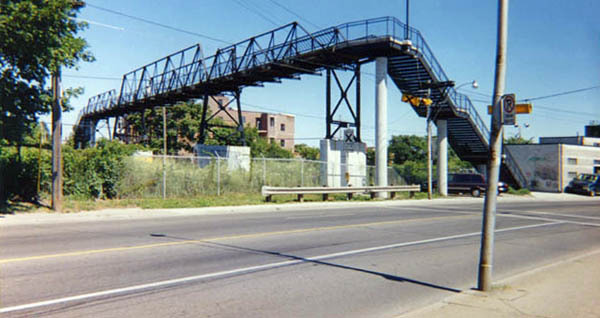 This is before the “Wallace Station” name. 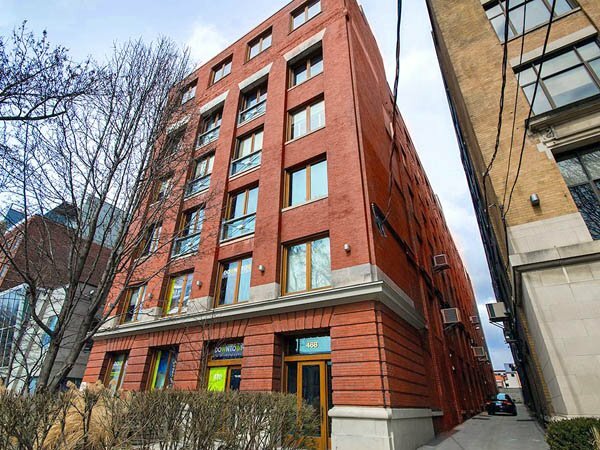 Note the starting price of only $78,900! I can’t find any solid info on when it was built. Accepted history says 1928 or 1929, but there is no evidence. A photo of the foot bridge from 1915 shows nothing there, and the 1924 Goad’s map has the spot as vacant. Next photo I can find is from 1951 and the factory is there. No reason not to believe ’28 or ’29 but no hard evidence either. Nacan left in 1988, but there is another gap in the building’s history. 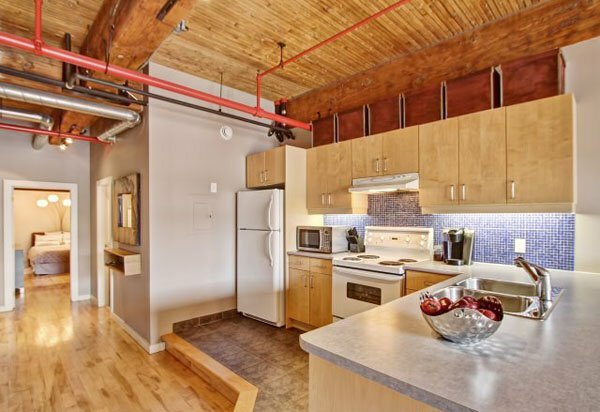 Looking on MLS, the lofts were originally marketed as the West End Lofts in 1999. 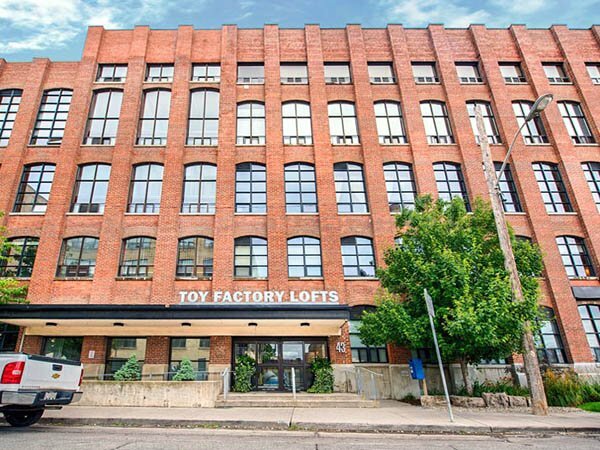 But then in 2000, they started being listed as Wallace Station Lofts. 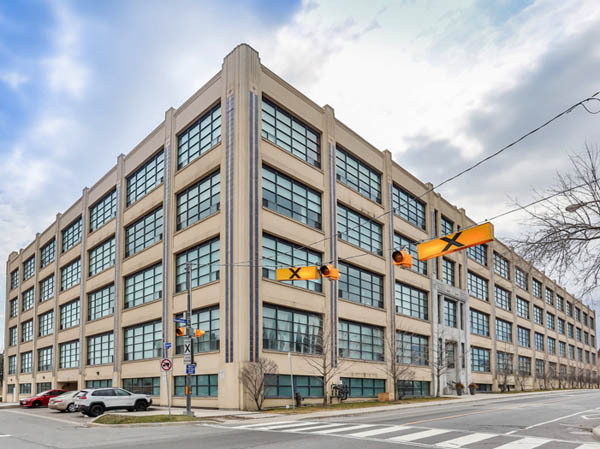 The seller was listed as 131761 Ontario Inc., but we know it was George Vandenbergh. Sort of. The project was already underway when he got involved. 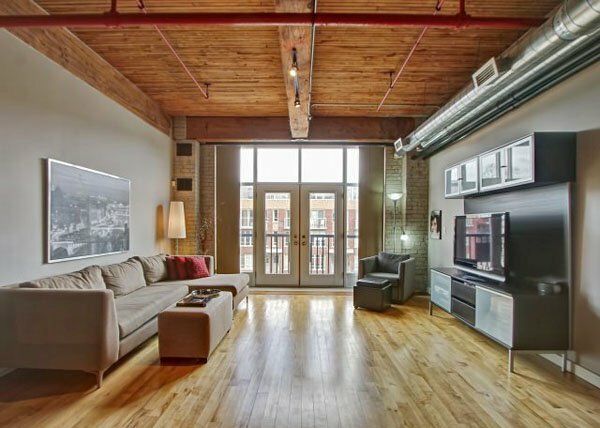 He bought out the offers of the bulk of the original buyers and decided instead of a low-end loft conversion, he would turn Wallace Station Lofts into a showplace preserving all the original architectural elements such as exposed brick and cast-iron hardware as well as the post-and-beam Douglas Fir construction. This jibes with what I recall. I remember it being for sale for a long time. And when I started showing it, units purportedly via the builder, they had been very obviously lived in. And lived it for a long time. 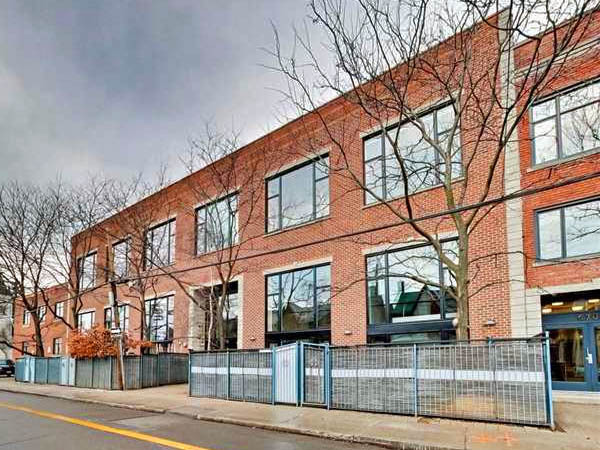 It looked like it had been converted, then rented for years, then they sold the units as-is. The conversion wasn’t 100% complete until 2007. I am not sure when Vandenbergh got involved or what had happened before that. 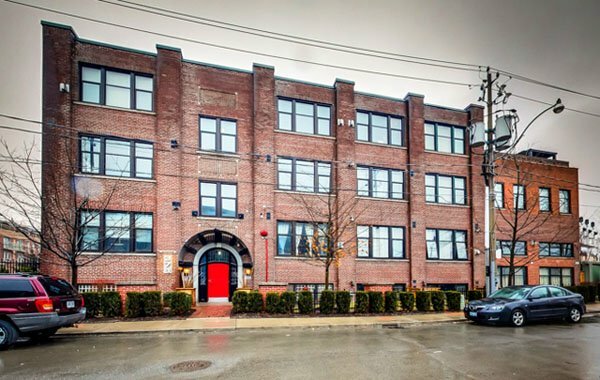 No matter, when he had the opportunity to step into Wallace Station Lofts, he jumped at the chance. 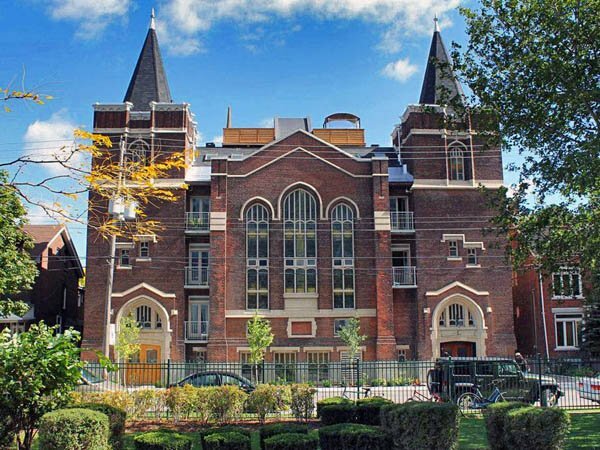 He further enhanced the building by adding other older elements such as a magnificent antique, solid oak door with brass hardware for the front entrance and some 1850s Parisian iron rondelles from his personal collection of antiques to decorate the fence he designed for the perimeter of the property and the Juliette balconies. 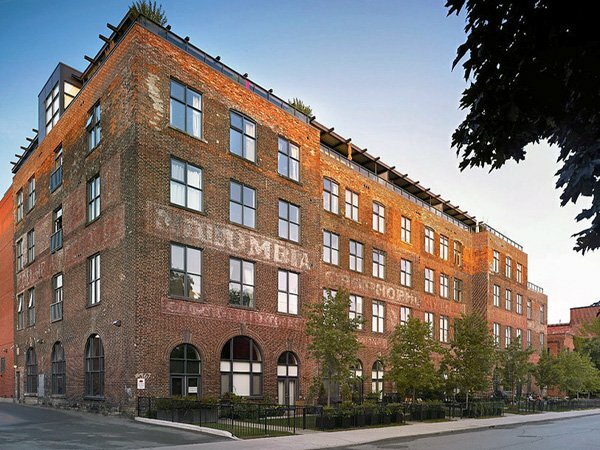 This early 20th-century factory is one of hundreds and hundreds of such buildings in this city that have found new use and new life in recent years. 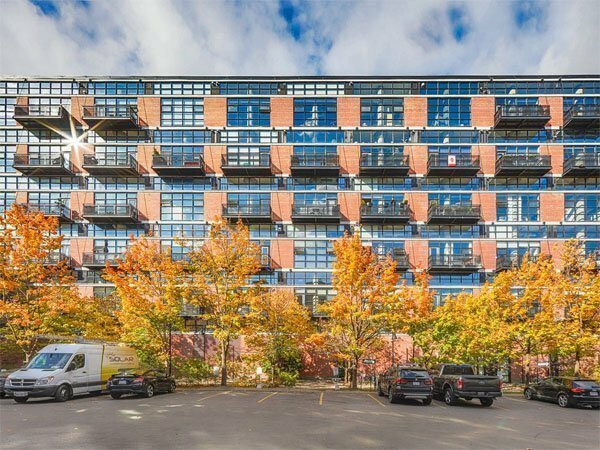 Though not beautiful by any stretch, the Wallace Station Lofts come close enough that it’s hard to tell the difference. 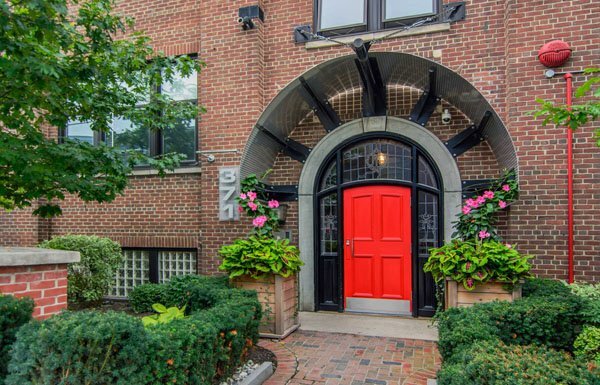 With a new front entrance (and tomato red door) and large horizontally organized windows, the red-brick structure has acquired an unexpected stateliness that belies its utilitarian beginnings. 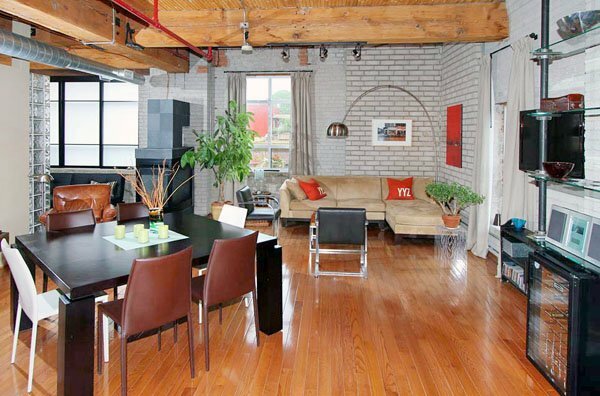 The vertical piers that rise from ground to just above the roof line add a fortress-like quality to things. 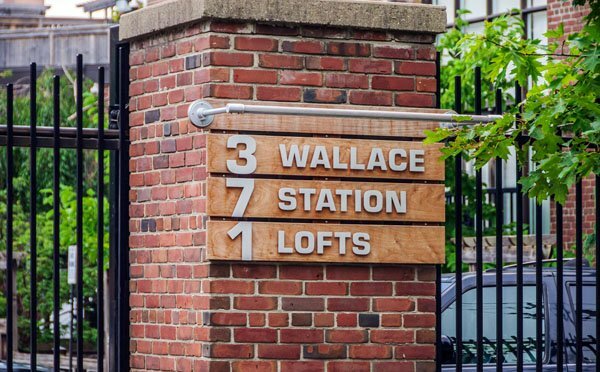 Though from the outside the Wallace Station Lofts doesn’t look like the kind of place where you’d expect to find granite counter tops and stainless steel stoves, it probably is. 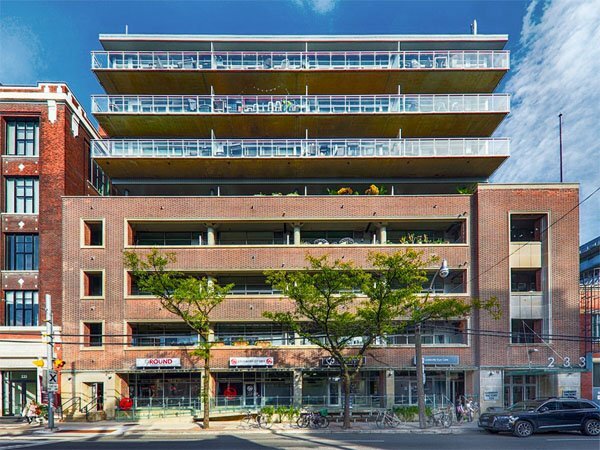 Its charm lies in the fact that it is most emphatically what it is, that it hasn’t been tarted up and that these interventions, however minimal, are enough to alter completely the flavour of the building. 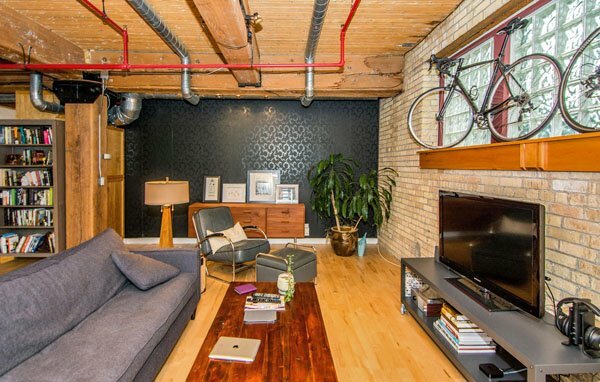 In this way, a 90-year-old masonry box has become a part of the modern city, of greater utility than ever but a lot more attractive. 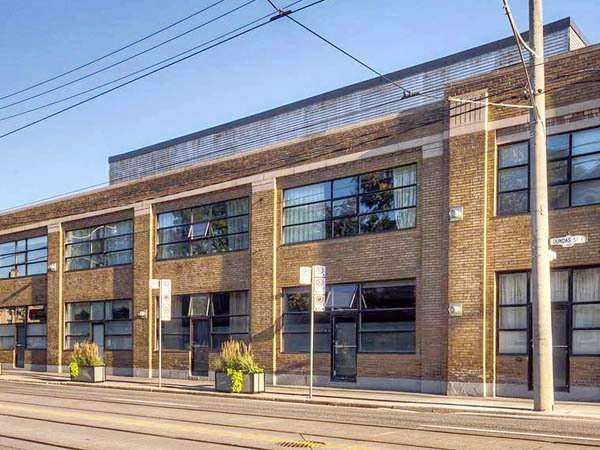 Projects such as the Wallace Station Lofts may not appeal to everyone, but for those unafraid of a little grittiness it’s irresistible. Besides, with grittiness comes authenticity, a commodity that has never been harder to find or more sought after. 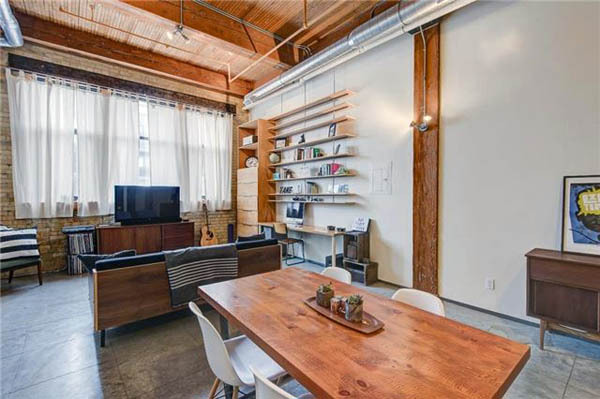 The charm of industrial conversions usually means living in an industrial neighbourhood or one undergoing a transition. That is the case here. 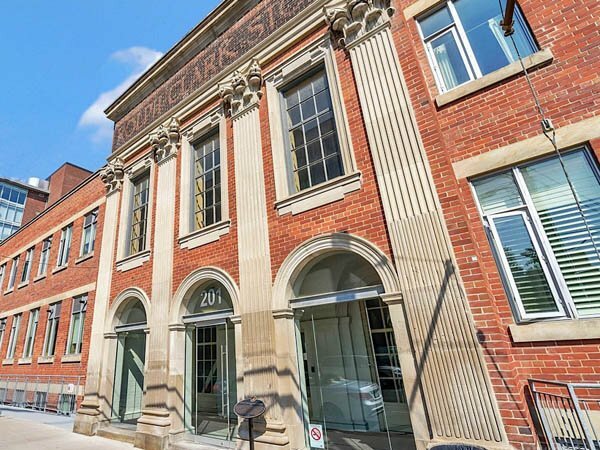 Wallace Station Lofts, which draws its name from a nearby old train station and the proximity of both GO train and subway stations, is situated on Wallace Avenue, two blocks north of Bloor Street West and a block west of Symington Avenue, just down the street from Wallace Studios – used by movie industry production companies and stars of the silver screen. 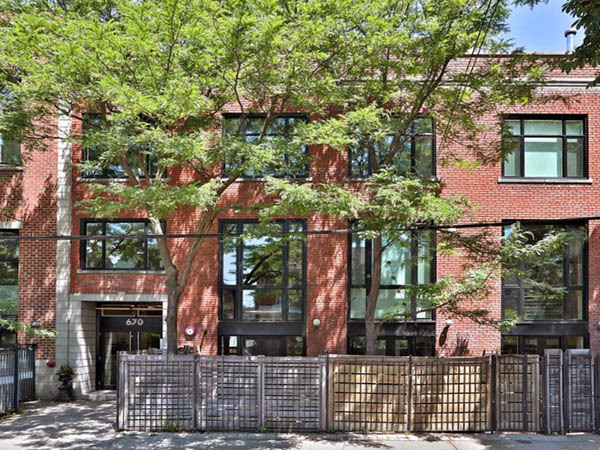 It’s also very close to High Park, Bloor West Village and the Roncesvalles neighbourhood. 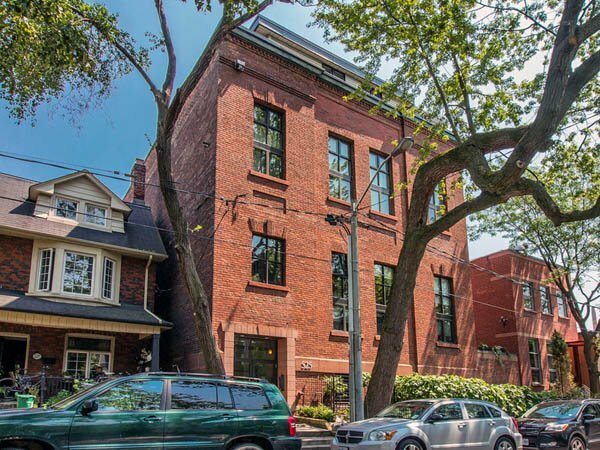 And Wallace Avenue (which no one would rank among the memorable thoroughfares in Toronto) is better than it looks. 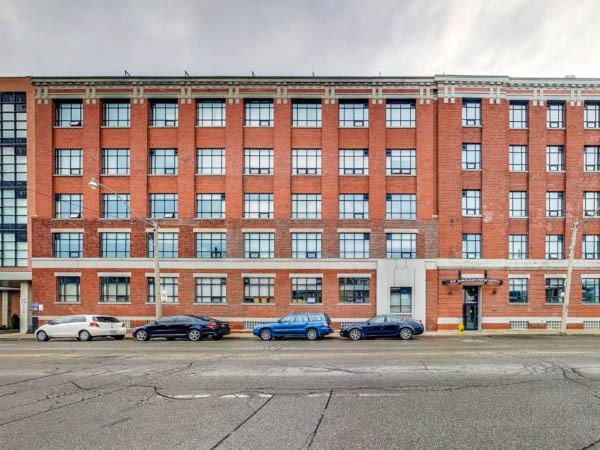 This mixed landscape of old industrial heaps and lowrise residential can appear bleak, but the visitor soon realizes that this is a healthy and vibrant neighbourhood. 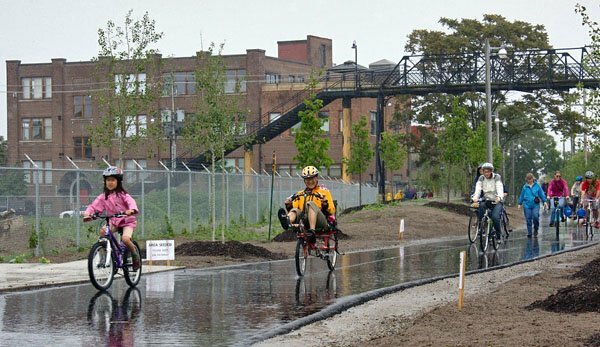 The advent of the West Toronto Railpath, which passes beneath the Wallace Ave. footbridge, will only enhance the area by making it more accessible and pedestrian-friendly. NB: The Wallace Footbridge is somewhat famous in its own right, having been in place since the 1890s! 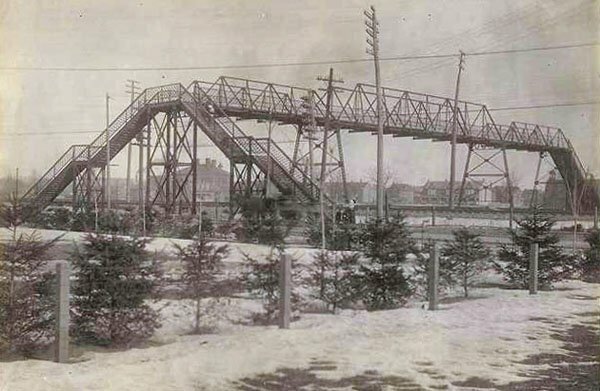 The Wallace Avenue Footbridge sometime in the 1890s – it’s been there a long time! 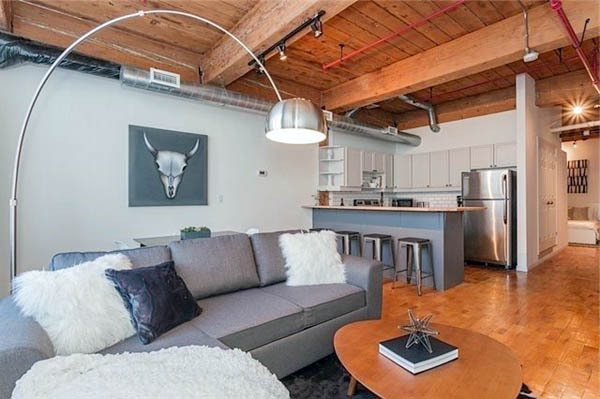 Current Listings at the Wallace Station Lofts.